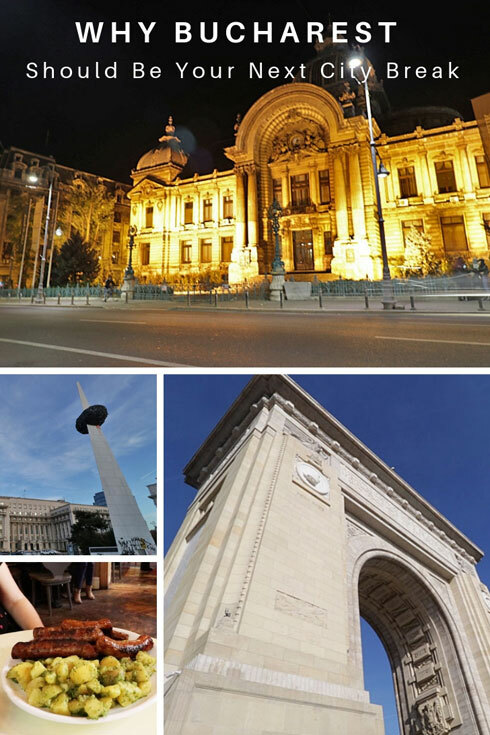 When we told friends we were taking a trip to Bucharest the most common response was why? Despite Brits taking more and more weekend breaks to former Eastern Bloc cities such as Tallinn, Prague and neighbouring Budapest, why wasn’t Bucharest on their radar? Romania is easy to get to (just under 3 hours from London), it’s part of the EU, it has a rich history, Dracula lives there and Prince Charles loves it, so what are we missing? Fortunately, there is a group of passionate Bucharest locals – “ExperienceBucharest” who want to address our preconceptions. 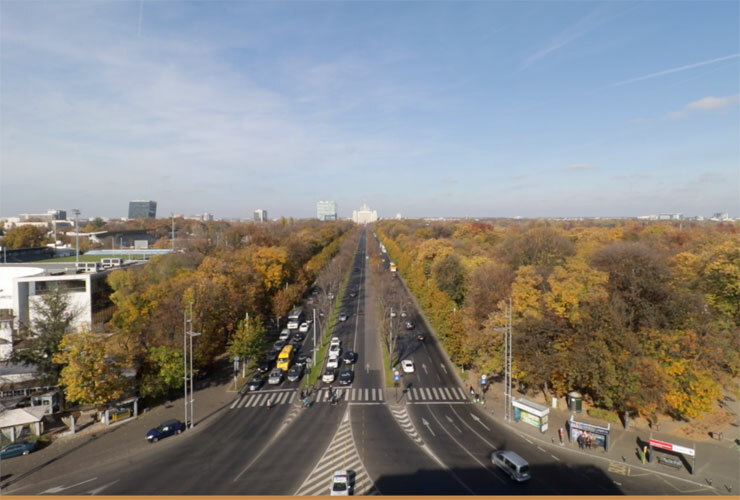 ExperienceBucharest’s mission is to share their love for the city and show the world Bucharest’s diverse culture, its architectural heritage, the excellent food and everything this historic city has to offer. So in November, we flew into Bucharest to meet the ExperienceBucharest team and to really “Experience Bucharest” for ourselves. As you approach the city centre, Bucharest can look a bit rough around the edges. It’s a mix of harsh communist tower blocks in various states of repair, Parisian style Art Nouveau, some New York Art Deco and ultra-modern hotels and offices. Talking of Parisian style, as you approach the city from Otopeni airport you could be forgiven for thinking you are in Paris. 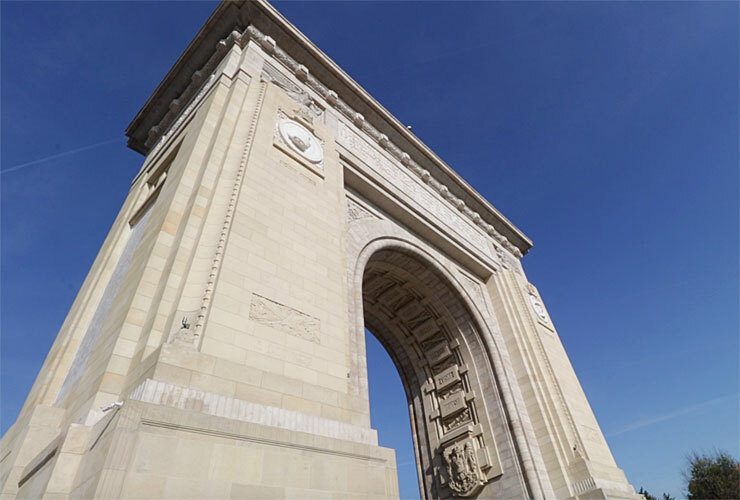 Driving up the tree-lined boulevard Șoseaua Kiselefand you are greeted by Bucharest’s very own Arc de Triomphe, the Arcul de Triumf. The 27m arch has an internal staircase so you are able to climb to the top and get some great views of Kiseleff Park and Herăstrău Park and in the distance, you can see the Casa Presei Libere (House of the Free Press) which was the tallest building in the city between 1956 and 2007. 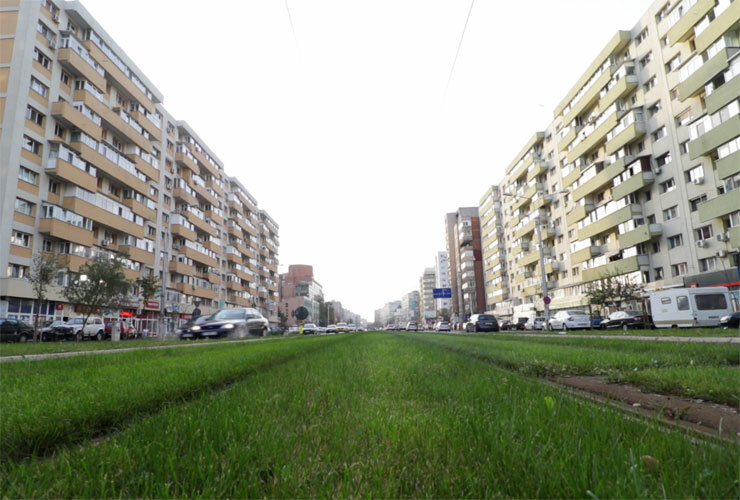 As you can see, Bucharest is not short of parks and green spaces. As mentioned, Bucharest does look a bit rough around the edges but don’t be put off, the city is very safe. 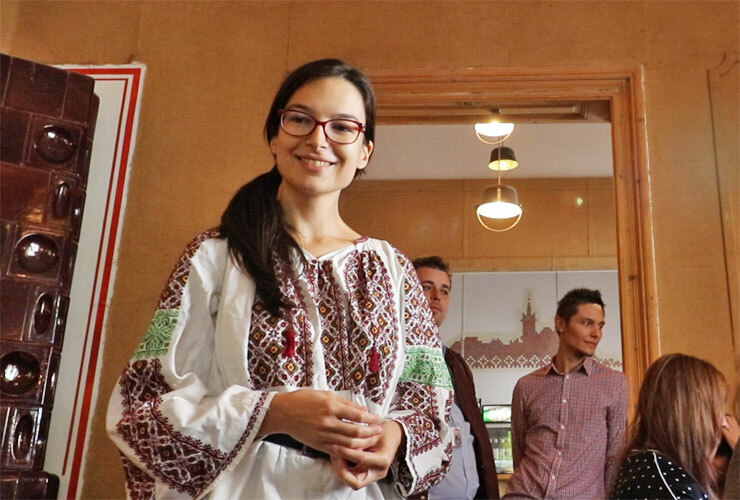 Also, unlike many other European cities which have become expensive, overcrowded and indifferent to tourists the Romanian people are pleased to see you. They are proud of their city and country and want to share their passion and stories with you. This leads us on to their hospitality, you won’t go hungry during your visit! As you can see, the food kept coming and it tastes good, especially if you love garlic (you need something to keep the vampires away)! Tucking into a traditional Romanian lunch with plenty of garlic as Ioana, our innocent looking guide from MySecretRomania treated us to bloodthirsty folk stories about the exploits of the real Dracula, Vlad the Impaler and his love for sticking poles up people. There is no escaping Bucharest’s tumultuous history and the dark days of the Nicolae Ceausescu and his communist regime. There was forced urbanization and the destruction of many of the old buildings in order to build a Romanian communist utopia. 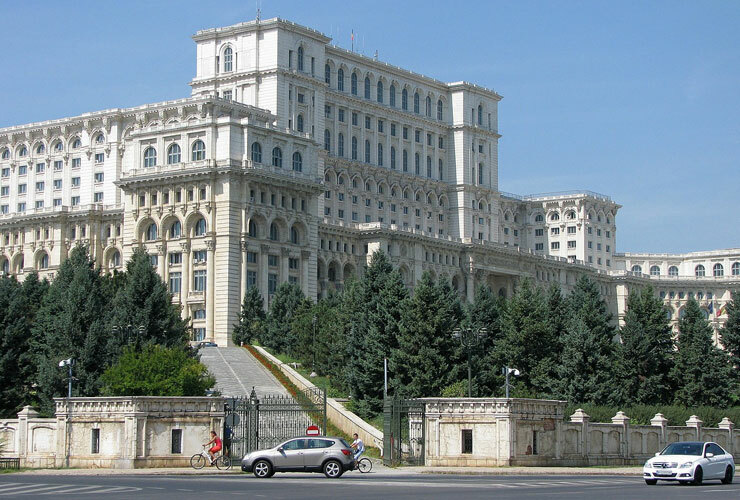 During the 1980’s, as his paranoia increased and following a trip to North Korea which greatly influenced his cult of personality, Nicolae Ceaușescu ordered the building of the House of the Republic. The House of the Republic (renamed The People’s House after the 1989 Revolution) was to be the centrepiece of Ceaușescu’s ‘Project Bucharest’. The colossal building was started in 1984 using an army of ‘volunteers‘ and wasn’t complete until 1997, well after the end of Ceaușescu’s regime. It remains the second largest administrative building in the world after The Pentagon in the US. The palace is just as deep as it is high and includes Ceaușescu’s nuclear bunker with its 1.5m thick concrete walls. 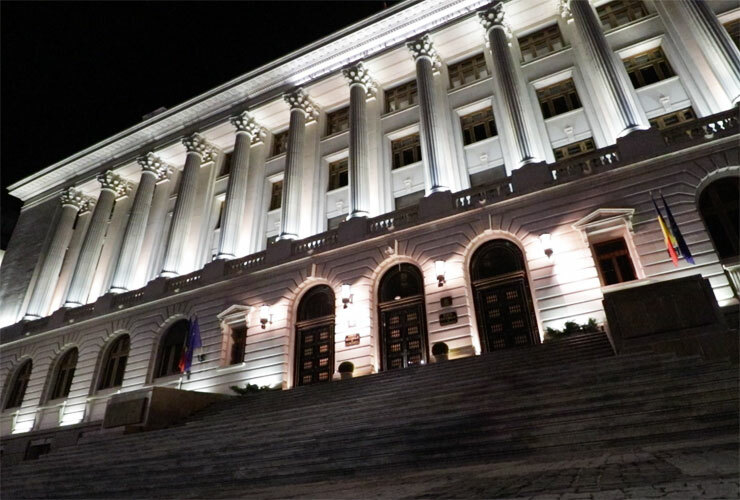 Today, as well as housing the two houses of then Romanian parliament it is home to several museums including the National Museum of Contemporary Art and the Museum of Communist Totalitarianism. To fully get the sense of Romania’s communist past and the subsequent revolution of 1989 we took a guided walk with a local from “Tour Of Communism“. During the tour, our guide shared her first-hand experience of living under the regime and the revolution of December 1989. Unlike the fall of communism in many of its neighbouring countries, the revolution in Romania was not a peaceful one. It began on 15 December in the city of Timisoara where troops fired on the demonstrators. The protests soon spread across the country but luckily many generals ignored Ceaușescu’s orders to shoot the people. It came to a head on Christmas Day, when Ceausescu and his wife Elena were executed by firing squad. 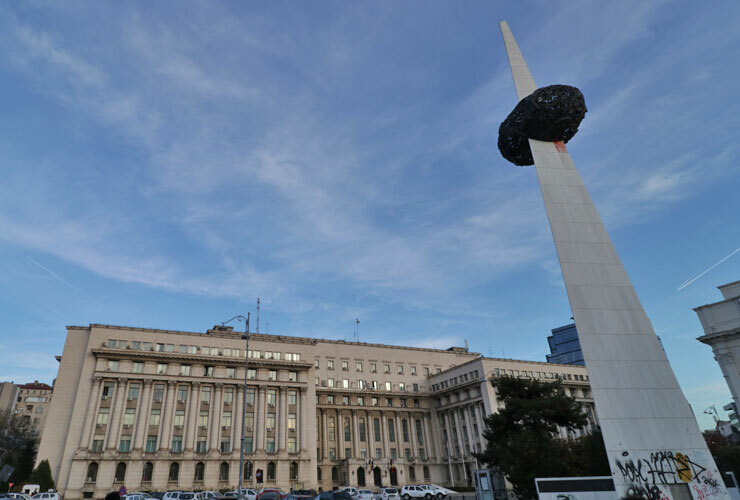 There is a monument to the revolution officially called the ‘Monument of Rebirth’ but due to its abstract design, extremely high cost and lack of public consultation it is somewhat neglected and not at all popular with the Bucharest locals. Things have very much changed since 1989, Romania joined the EU in 2007 and in 2019 Romania will take the Presidency of the EU council, so all eyes will be on Romania and Bucharest. We took a very interesting trip entitled “Real Life in the Neighbourhood of Giants with Open Doors Travel to the infamous neighbourhood of Pantelimon. With its rows and rows of 1970’s communist housing blocks, it did have a very poor reputation and was the home to Romanian rap band B.U.G. Mafia. Our guide, who was brought up in the neighbourhood and still lives there explained how things have changed in recent years and the parks and public area have been cleaned up. 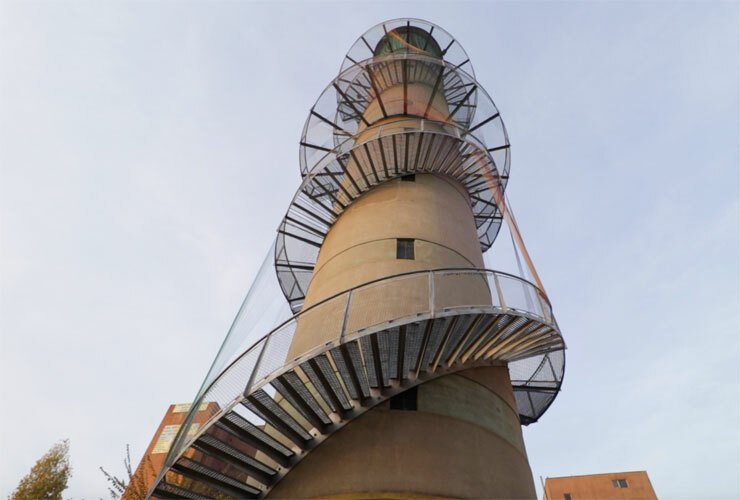 There is an interesting art installation on a converted industrial water tower known as the Pantelimon Art Tower, definitely worth the climb for the views but not recommended for anyone who doesn’t like heights, especially when you can look straight down through the mesh stairs and see the ground. Back in the city centre and in direct contrast to the harsh, utilitarianism of the suburbs we came across the Romanian Athenaeum. 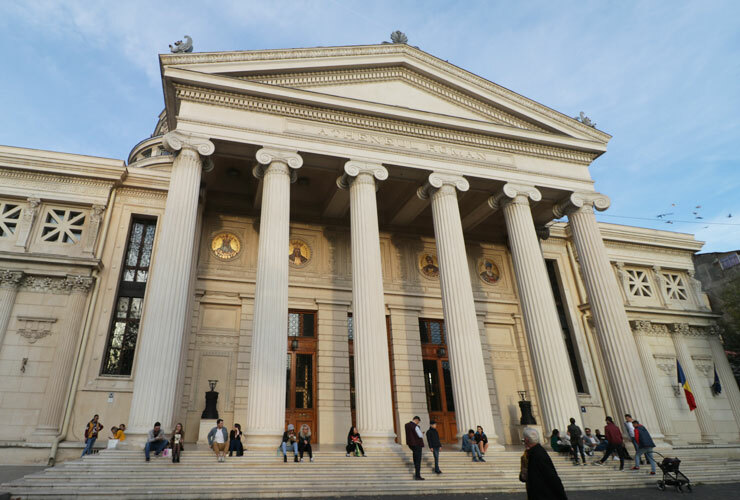 A neoclassical French designed concert hall which was restored to its original glory and saved from collapse in 1992. Just a reminder that as well as neglect and mismanagement during the communist era, Romania is in an active seismic zone. 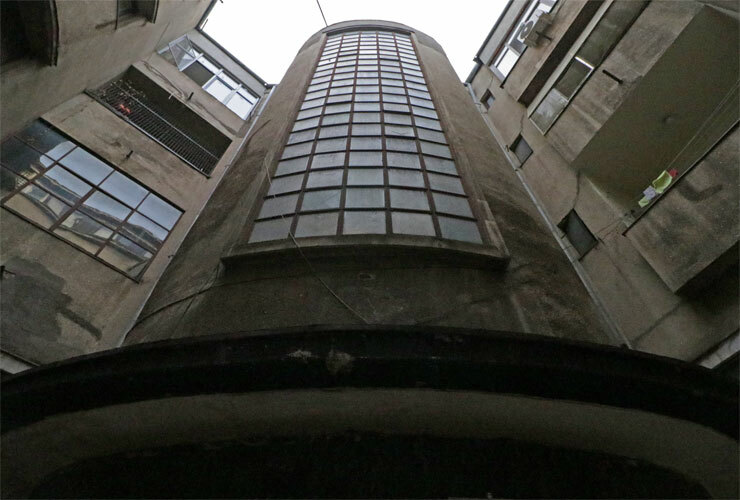 To find out more about the architecture of Romania, including the palaces, the ‘Belle Epoque’ period and the hidden Art Deco gems, take a trip with Walkabout Free Tours. 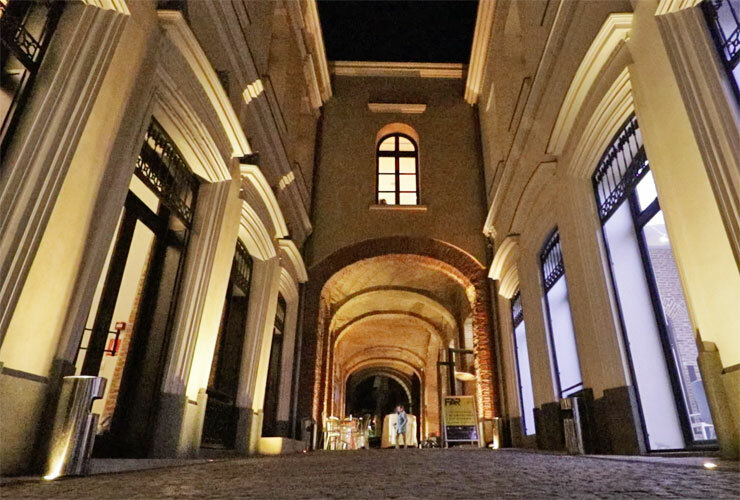 One of the best ways to get the atmosphere of Old Town Bucharest is to take a night time tour. The lights and shadows can take you away from the 21st century and back to the extravagant “Little Paris” days of the 19th century. We took the “Old Town Legends & Stories” tour with BTrip Bucharest. As well as stories of love, passion and excess from 19th century Bucharest we also got some spooky stories about our old friend Vlad Dracula. Interestingly Vlad’s reputation in Romanian is not the same as the rest of Europe. In many stories, Vlad is presented as a hero fighting for Romanians against Ottoman invaders. 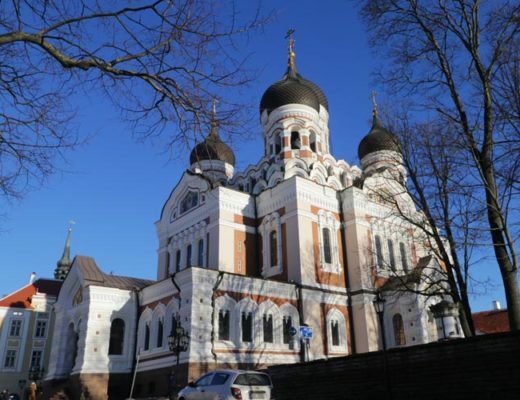 What you will notice when walking the city are the number of beautiful Orthodox churches complete with their ornate gold icons. One of the best examples of these is the Stavropoleos Church in the Old Town. It was originally built in 1724 and is part of the Stavropoleos Monastery. The courtyard of the church contains a collection of stone crosses and remains of other Bucharest churches that no longer exist. Getting There – Direct flights from the UK to Bucharest are available from Britsh Airways, Wizz Air, Blue Air, Ryanair and Tarom. The flight time is about 3 hours. 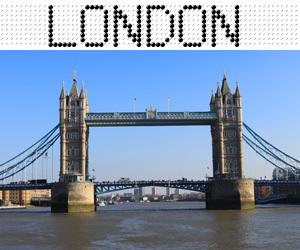 Staying There – Accommodation is cheaper than most European cities, a night in the 5-star Radisson Blu Hotel starts at £95. 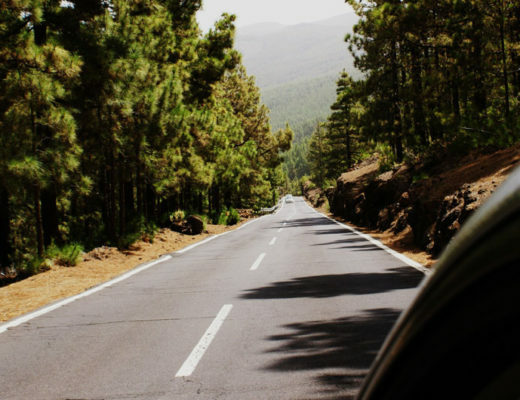 Getting Around – Uber is readily available and cheap. Most 10-minute trips within the city cost around £2. The Uber price from the city centre hotel to the airport cost around £6. We were not impressed by the local taxis service, you are better off sticking to Uber or Taxify. Although like most cities, the best way to get around the centre is by walking. Money – The exchange rate during our trip was 5 Lei to the pound. We changed money when we got to the city and the rate was comparable to XE. Although the currency is known as the Lei the abbreviation is RON. Food & Drink – Although the hotel room rate is reasonable the price of their food and drink is expensive and comparable with UK hotel prices. 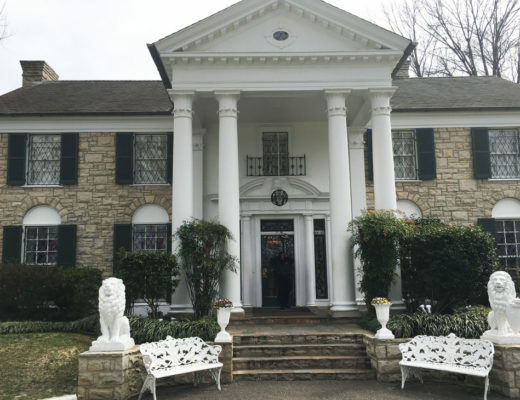 However, once you leave the 5-star hotels, the prices in the bars and restaurants are very reasonable and the quality of the food and drink is excellent. So, I hope we’ve convinced you why you should make Bucharest your next city break. 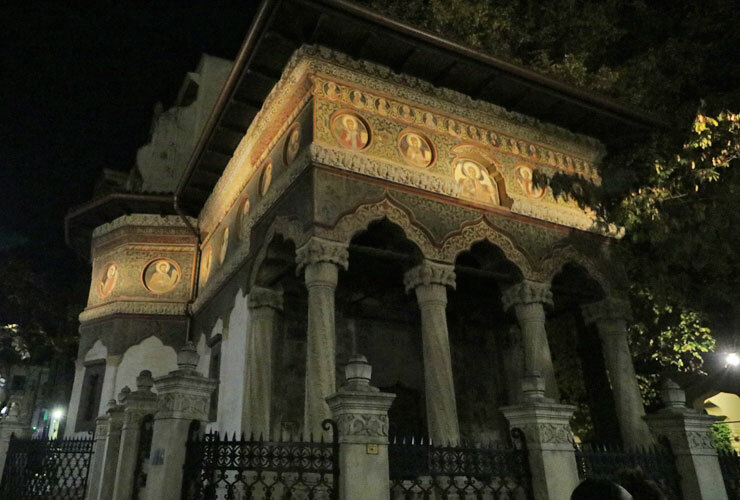 Also, check out Mel’s post on why you should visit Bucharest here. If you do have a little more time when visiting then you should definitely get out of the city and explore the stunning Romanian countryside too. its HOT, wow, its HOT, unless you’re travelling up a mountain to go skiing. 40 degrees in the shade, phew. The people are warm, inviting, eager to please, most speak English, i would compare my time there to France, Spain or Italy and having traveled Europe extensively, i would definitely go back to Romania, no jumpers or coats though this time. We were there at the start of November so the weather was comfortable, nice temp during the day but you need a jacket at night. It does get cold in the winter and yes, it is hot in the summer. Looks really interesting and pretty at night but I don’t think I could climb that metal staircase around the tower. The nighttime tour was really good. A few of us were not that comfortable with that tower climb on the metal stairs although the views were worth it. I really love garlic so I think I would love the food and help keep the vampires away. 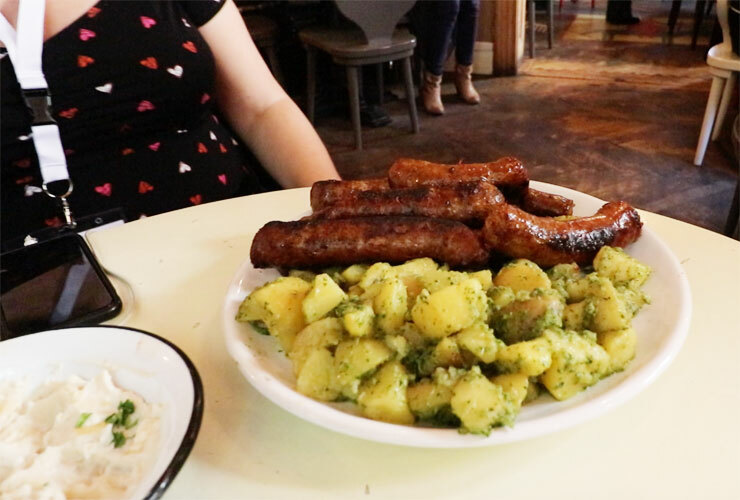 The sausages with the garlic potatoes were really nice, but you have to make sure everyone is eating garlic so they don’t notice the smell on you.